The fight over songwriting credits continues. After over a year, the court case has finally been resolved - read the full report here. The ongoing drama in the Paramore camp kicked up a gear this week as the battle over writing credits and royalties continues. The Daily Mail uncovered some exclusive details from inside the courtroom as former bassist Jeremy Davis files his case against the band and the label. So, what exactly is going on? Here's a few new things we've learned as the case develops. 1) It's all about the Paramore album. The band's self-titled 2013 low-key classic saw them experiment with a wide variety of styles and genres to huge success. Davis claims that Hayley and Taylor agreed that the three of them would share authorship for all 17 songs on the album. In the end, Jeremy only has a credit on "Interlude: Holiday", a 1m 90s ukulele ditty. 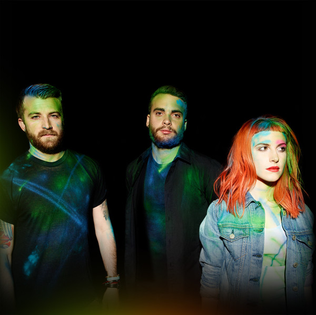 2) Jeremy claims he's behind "Ain't It Fun". The band's biggest ever hit sold over 2m copies and won a grammy. Davis now claims he was responsible for the overall "funk style" of the track and others like it. He also criticises Hayley for allegedly giving him credit for his involvement in interviews but not following through when credit mattered. 3) What does Jeremy want? Davis is seeking compensation that could be in the region of millions of dollars. (Davis) suffered substantial monetary damages as a result of Defendants' unlawful conduct, including, but not limited to, being excluded from participating in income arising from royalties, licensing, and other monies generated from the musical compositions and sound recordings embodied on the album Paramore. He is now seeking for all copyrights to be changed by Hayley and Taylor to include his name as well as receiving "damages" in an amount to be determined by lawyers. 4) Who is in the frame? Besides Hayley and Taylor, Jeremy is also taking legal action against Mercado, Fly South Music Group, Childress and Curo Financial Management for failing to properly advise him during his time in the band. The court case continues and, as fans, we hope that all is resolved quickly and amicably. Hayley Williams Talks Paramore Lineup Drama Aboard Parahoy!